Andrea Kehl learned to handle scissors, combs and brushes early on. Trained on the beautiful Lake Starnberg with the celebrity hairdresser Brigitte Ciesela she also acquired the adoration for celebrities. Andrea Kehl continued her career and in the salon A & T at the hotel Bayerischer Hof Munich she was able to style next to her regular customers also the stars and starlets of the show and film industry. In 2012, Andrea Kehl opened her own luxury salon in Munich Bogenhausen. This cosmopolitan salon could also be located in New York - Paris or London. In 2012 the Salon furthermore became a member of the LSW - Leading Salons of the World. 6 years after the opening, Andrea Kehl is taking now a next logical step. Surrounded by a hair expert team, she transformed her many years of experience into her own product range. Not only individual hair care, but also kindness is very important to Andrea Kehl. This is reflected in her products as well as the unique salon atmosphere. 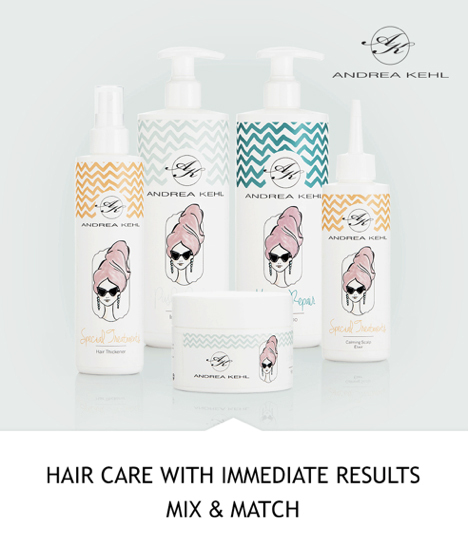 Andrea Kehl's Mix and Match Hair Care Products: Keratin Repair - Volume Push-Up - Special Treatments.